It has been a usually quiet stretch for the market over the last month and a half or so since mid-July. After breaking out to new all-time highs in July, S&P 500 settled into a narrow range between 2140 and just under 2200. During this time S&P 500 has not had a daily move in excess of +/- 1% (on a closing basis) in 43 trading days including today. July 8 was the last day S&P 500 recorded a move exceeding 1%. In late August we noted the streak at 33 trading days. At that duration (and under the assumption that the streak would likely end soon) the subsequent trading action of all similar or longer past streaks was relatively benign. S&P 500 was up 1-Month after streaks of 33 or more trading days 50.9% of the time, but with an average loss of a modest 0.14%. 3-, 6- and 12-months later S&P 500 was up 60-70% of the time with respectable average gains. The 33-day streak table can be viewed here. 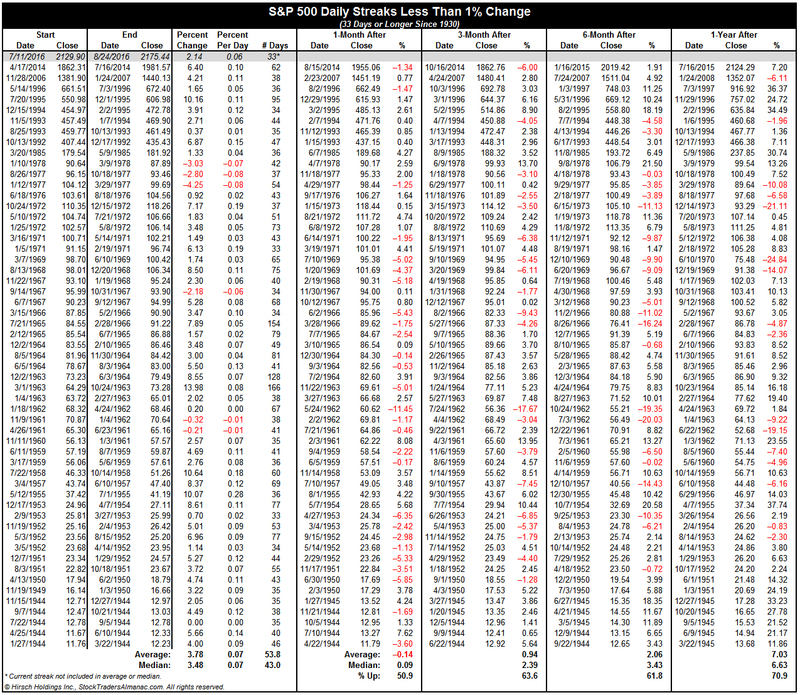 As of today’s close, S&P 500 has extended its streak of not exceeding +/– 1% to 43 trading days. When past streaks of 43 trading days or longer are examined there is a clear shift in S&P 500’s subsequent performance. At the 1-month point after such streaks ended S&P 500 turns more bearish advancing just 42.9% of the time and the average loss extends to –1.12%. Its 1-month median performance also takes a dive from positive 0.09% to negative 1.30%. Performance at the 3-, 6- and 12-month intervals also weakens. Average performance at 3- and 6-months after the streak ends becomes negative and percentage of “Up” occurrences slips to just above 50%. Average performance 1-year after the streak ends tumbles to just 3.86%. Looking ahead the data bears out further reduction in subsequent performance when S&P 500 extended its streak beyond 53 trading days (shaded in light grey). At 53 trading days and beyond, 1-, 6- and 12-month later performance declines even further. 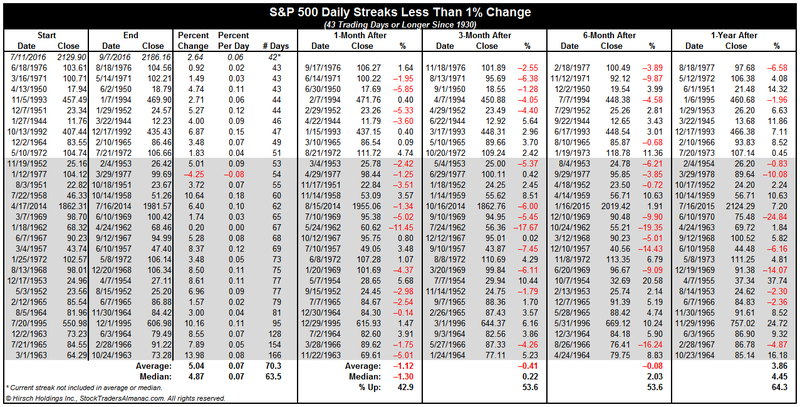 History suggests the longer the current streak without a +/– 1% S&P 500 daily move runs, the greater the odds become for declines after it ends. In the face of all this low volatility, the market has held on to its Worst Six Months gains, bringing out once again the Sell in May naysayers. However, a look at page 32 and 62 of the Stock Trader’s Almanac 2016 will remind you that the Worst Six Months has been quite strong in election years. The positive mindset of electing a new commander in chief helps buoy U.S. equities throughout the second half of the year with only two losses in the last seven months of election years. So with the S&P 500 up 5.9% so far for the Worst Six Months of 2016, it begs the question, if the S&P is up May-October this year what does that indicate for the next Best Six Months, this year and next as a whole? We’ve broken out the data into four tables: Great, OK and Bad WSM, plus Great and OK WSM in election years. With seven weeks left in the current WSM, the September/October disaster area upon us and the polls showing Trump gaining traction, it remains to be seen if the gains will hold. In the table above of Great WSM, the next BSM is up 23 of 26 years with an average gain of 9.2%. The year as a whole is even better, down only once with an average gain of 20.9%. The following year is also pretty good, though not as much, up 73.1% of the time with an average gain of 10.1%. Note below how the year after really Bad WSM has been the best. The table above shows years we deemed to have “OK” WSM in the range of +4.5% to –3.8%. With the 2016 WSM up 5.9% currently, it could easily slip into this category. The BSM following these years produced gains in only 65.4% of the years up 17 of 26 with an average gain of 5.3%. The year as a whole and the next year in this table were not as strong as the Great WSM in the first table. The whole year is up 80.8% of the time with an average gain of 8.5%. The next year is considerable weaker up only 61.9% of the times with an average gain of 4.9%. The Bad WSM years show solid bounce back in the subsequent BSM with gains 80.0% of the times and an average gain of 6.5%. The whole year is horrible, down 80.0% of the time with average losses of –11.2%. The following year is the best of them all, up 86.7% of the times with average gains of 13.6%. Note that there are only two election years in the bunch, 1956 (Russian invades Hungary in October) and 2008 (Great Recession). Since this is an election year and WSM is on the cusp of Great and OK, we broke out these election years. This table indicates that the greater the election year WSM gains are, the greater the likelihood of gains in the subsequent BSM, this year and next. However, as you can see from this table and the Bad WSM table, the post-election year, next year, is prone to weakness across the board.